The SGPC today faced yet another unsavou- ry situation when its secretary, Mr Raghbir Singh, joined hands with expelled Akali leaders to stake claim for the party ticket from Rajasansi for the forthcoming Assembly elections. The Akal Federation today emphasised the need to call ‘‘sarbat khalsa’’ at Akal Takht to sort out the crisis created after ‘‘arbitrary and biased’’ edicts (hukmnamas) pronounced by Sikh clergy. A youth from Kapurthala city was murdered in Manila on Thursday. Around 100 Punjabis have already been killed in the Philippines in the past five years, 70 of whom belonged to the Doaba region. So much so, 10 persons from Kapurthala district alone have been killed in Philippines in just past seven months. The Supreme Court today upheld the minority status of Ludhiana-based Christian Medical College (CMC), a premier health institution of Punjab, in the light of last year’s Constitution Bench judgment, doing away with the government quota in unaided private professional colleges and allowing full freedom of management to minority institutions. The Punjab State Schedule Castes Commission today directed the district administration to constitute a committee comprising the SDM, DSP and District Welfare Officer to look into the allegations of atrocities meted out against a deaf-and-dumb girl of Kulgari village here and submit its report within a week. The dream of 84-year-old Sarjeet Kaur, that her country would recognise the sacrifice of her husband, an INA veteran, will remain unfulfilled as she breathed her last on Tuesday while waiting to get her pension. Punjab Pardesh Congress Committee president Shamsher Singh Dullo today warned the Congress workers and leaders against sycophancy. He said no minister or leader in the state was above the Congress party and they should strengthen the party and shun personal gains. Residents of Narot Jaimal Singh bloc of the district are being forced to travel on boats despite of the presence of a temporary bridge. The bloc is cut from the rest of the district by the Ravi river. The platoon bridge constructed over the river is removed during the monsoons due to the increase in the flow of water. The Union Government has allowed the Punjab Government to send Rs 11 lakh for the reconstruction of the historic Katas Raj temple in Chakkwal district of Pakistan. The district administration today handed over the cheques worth Rs 2 lakh each to the 13 remaining 1984 riot affected families during a function. Dr Harbans Lal, Chief Parliamentary Secretary, presided over the function. 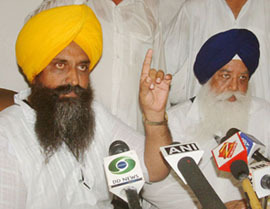 The Punjab Brick Kiln Owner’s Association in its meeting held here today decided to close down their brick kilns for an indefinite period in protest against the indifferent attitude of the state government towards their genuine demands as well as against the behavior of Mr Avtar Henry, Food and Civil Supplies Minister, and Mr Surinder Singla, Finance Minister, who could not arrange their meeting with the Chief Minister for the last one-and-half-year irrespective of their best efforts. The SAD (Amritsar) president, Mr Simranjit Singh Mann, has demanded a retrial in the Akshardham temple firing case in which three persons-Chand Khan, Adam Suleman Ajmeri and Abdul Kayum Mohammed Hussain Mansuri- have been sentenced to death by a POTA court. The BJP’s ‘Mehngai Virodhi cycle yatra’ led by its state President, Mr Avinash Rai Khanna, reached Jandiala, about 18 km from here, in the evening today after passing through Kartarpur, Subhanpur, Dhilwan, Bias and Raiya. The yatra started its third day’s journey from Jalandhar in the morning. Premila Gupta, nee Dharamwati Bhandari, the mother of a Punjab-cadre IAS officer Robin Gupta, died at a farmhouse of the family located in Panchkula district today. The Punjab government has asked all the Deputy Commissioners to launch an awareness campaign in Punjab to make people aware of the risks involved in illegally trying to enter Europe through countries like Mauritania, Zouret and Morocco. At least 24 agitated relatives of a deceased patient manhandled junior doctors in the surgical ward number four in government-run-Guru Nanak Dev Hospital and broke furniture of the hospital here yesterday. Questioning the tenders floated by the Directorate of Horticulture, Punjab, for the purchase of equipment and inputs to implement various schemes of the National Horticulture Mission (NHM), the Union Government has instructed the state government to inquire into the matter and submit a report in this regard immediately. The Punjab Government is in the process of making amendment to rules to allow Y.S. Ratra to continue as Chairman of the Punjab State Electricity Board (PSEB) till he attains the age of 65 years. The main accused of the triple murder case of Takkipur village in Kharar, Jagjit Singh, today allegedly made an attempt to end his life by consuming a poisonous substance in a makeshift jail in the Ropar district court. In a joint operation, the border security force and the Punjab police seized 2 kg of heroin worth Rs 2 crore in the international market and fake currency amounting to Rs 3,97,000 from near the BOP Jandewala, near the international border, last night. It was the lust for money that compelled an employee of a local commission agent to concoct a story of theft of Rs 1 lakh. Guru Nanak Dev University will start counselling for admission to Master in Business Administration and Master in Computer Applications from July 16 in the institutions affiliated to Guru Nanak Dev University, Amritsar, Punjabi University, Patiala, and Punjab Technical University, Jalandhar. Ms Tasveer Kaur, final-year student of B.Tech (Computer Science) at IET, Bhaddal, was selected for Greek Scholarship to complete her M.Sc in Hospitality Administration. The other two students from India who won the scholarship from Romania. Protesting against the state government’s policies, the Punjab Cotton Factories and Ginners Association has decided not to offer any factory to Markfed and the Cotton Corporation of India in the coming season. The decision was taken at the general house meeting of the association here today.